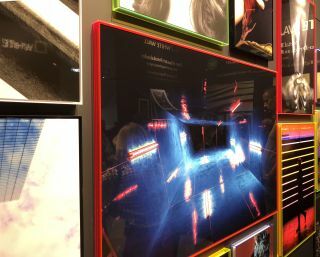 High-end wall art maker WhiteWall has launched an eye-catching new range of photo frames at the Photokina show. The Pop Art range of glossy acrylic frames comes in four bright colours in red, orange, green and blue – as well as in black or white – that appear to glow in neon colours when they catch the light. The effect is really quite spectacular, and viewers could be mistaken for believing that the frames are electrically lit, but the effect is achieved purely by reflecting the light that strikes the translucent acrylic material that the frames are constructed of. In addition, the a 4mm wide 'shadow gap' gives the impression that the image is floating in the frame. It's particularly effective for images of night scenes that feature neon colours or firework displays. The Pop Art frames are available in selected formats from 20x20cm to 120x80cm, and can be combined with different mountings, such as acrylic, aluminium dibond or HD Metal Print. Also unveiled for the first time at Photokina, the Acrylic Box frame comes in depths of 30 or 64mm, while the Slimline Case provides a more subtle and sophisticated look to photos mounted under acrylic glass. The company also showed off a new gold look for its Direct Print On Brushed Aluminium process, where the white parts of the picture are not printed, allowing the brushed, metallic surface to truly shine. Finally, its ultraHD Photo Print offers incredibly sharp image reproduction for detailed images and now uses a newly developed photo paper, Fuji Crystal Professional Archive Maxima, which gives the images stronger contrasts and more luminous colours. See https://uk.whitewall.com for more.